The last remaining EA-6B after its final flight, with wings folded, preparing to shut down at Smithsonian Udvar-Hazy Center. Photo courtesy of Jonathan Derden. VMAQ-2 aircrew and fellow Marine Prowler aviators of past and present stand in front of EA-6B tail number 162230 at Udvar-Hazy Center. Photo courtesy of Jonathan Derden. The VMAQ Monument Foundation is thrilled to report that the final three EA-6B Prowlers have landed at esteemed aviation museums in Ohio, Texas and Virginia. PARKER, COLORADO, USA, March 21, 2019 /EINPresswire.com/ — When aircraft are removed from service, they are often sent to a boneyard, such as the one at Davis-Monthan Air Force Base in Arizona. For the Marine volunteers of the VMAQ Monument Foundation, this was not an acceptable ending for the EA-6B Prowler. For many months, VMAQ Monument Foundation volunteers actively canvassed potential museums to assist in finding suitable homes for these historic jets. The Foundation is thrilled to report that the final three EA-6B Prowlers have landed at esteemed aviation museums in Ohio, Texas and Virginia. 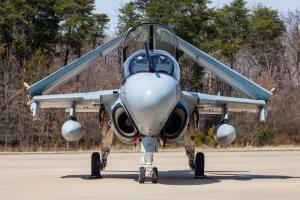 On Friday, March 8, 2019, the EA-6B Prowler was officially decommissioned at a ceremony at Marine Corps Air Station Cherry Point, marking the end of a distinguished era in airborne electronic warfare. According to a command release, “Marine Corps Prowlers have flown over 260,000 hours during its 42-year service life. Marine squadrons have deployed with the Prowler more than 70 times in support of every major combat operation in the last forty years.” The Prowler and the warriors who flew and maintained her were present in operations El Dorado Canyon, Desert Shield, Desert Storm, Deny Flight, Decisive Endeavor, Deliberate Guard, Allied Force, Northern and Southern Watch, Iraqi Freedom, Enduring Freedom, Unified Protector, and most recently Inherent Resolve and Freedom’s Sentinel. Two months earlier, on January 17, 2019, tail number 163047, was flown to the MAPS Air Museum in North Canton, Ohio. Their mission is to educate the public on the history of aviation and its impact on man. To accomplish this, they acquire, restore and display aircraft and memorabilia associated with aviation. Lieutenant Colonel Maureen McFarland USMC Reserve, a former electronic countermeasures officer (ECMO) from the EA-6B community is a supporter of this museum. She coordinated with the MAPS Executive Director Kim Kovesci and a team of dedicated people pitched in to make this aircraft transfer a reality. McFarland now has a Prowler in her own backyard in North Canton. “I’m incredibly proud of MAPS and the work the museum does. Ohio has a rich legacy in aviation from the Wright Brothers to John Glenn. I love that part of that history is now the aircraft that launched my career,” said McFarland. A third VMAQ-2 Prowler, tail number 162228 made its final landing at Dallas Love Field on March 12, 2019 and will reside at the Frontiers of Flight Museum in Dallas, Texas. Cheryl Sutterfield-Jones, President and CEO of the museum is excited to add the Prowler to their unique collection of aircraft. 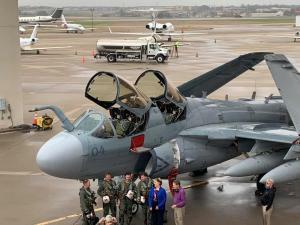 “Although the technology of the EA-6B is being replaced with more modern technology, the electronic and radar capabilities of the aircraft will become an important STEM lesson for than 40,000 students a year. This EA-6B will have a brand new mission at the Frontiers of Flight Museum!” Although the Foundation did not assist in the placement of 162228, they are excited to celebrate with the Museum at their upcoming Prowler Party on April 13! If you find yourself standing in front of a “Chariot of Electronic Armageddon,” pause and reflect for a moment. These aircraft along with the many men and women who flew and maintained them, quietly and valiantly, protected countless lives and served our nation well. You may have never heard of the Prowler before, but as her name suggests, she has been flying around the world for forty-eight years quietly stalking her prey. 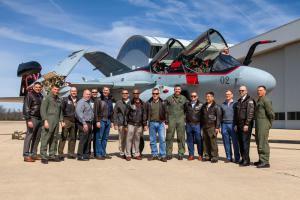 The VMAQ Monument Foundation was established in June 2018 with the mission of preserving the history and legacy of the EA-6B Prowler and the warriors who served in her community. To learn more about the VMAQ Monument Foundation and to donate, please visit VMAQMonument.org.